It always thrills my soul to see any and all things blue and white! Imagine my delight while visiting an antique shop and there she was...just waiting to come home with me. I knew exactly where she was gonna go the moment I saw her. This spot had looked a little dark with the black lamp(that I adore) so I'd just shuffle a few other lamps around. She sure does brighten and make the space feel lighter visually. 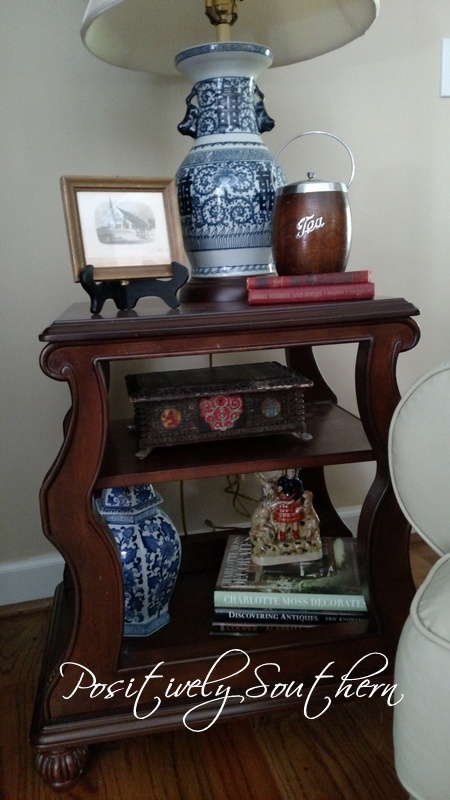 This side table is one of my fav in the house since there are 3 levels to decorate. It has been in this spot for ages now but I turned it sideways for a different look. Naturally, there was gonna be a piece of Staffordshire sitting atop a few decorating books. 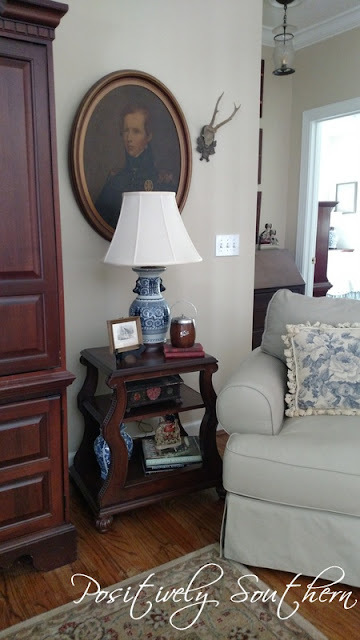 The blue and white jar was a find from Hobby Lobby some years ago. The small chest has yet to be seen on the blog. I found it back in the winter at Scott's Antiques, this box is amazing with just the right amount of red to make it pop. The dealer believed it to be well over 100 years old. SQUEAL! Back to the lamp, she couldn't be more lovely....more gorgeous...more perfectly blue and white! Oh Oh Oh...I almost forgot! 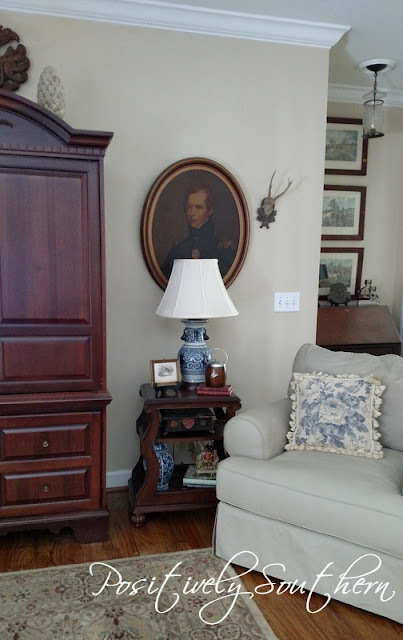 Did you notice the blue and white needlepoint pillow? Completely swoon worthy! 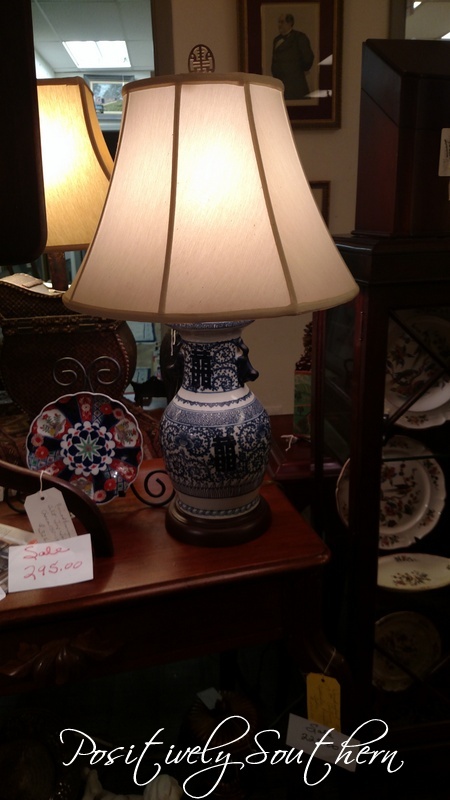 You are correct; that blue lamp is absolutely perfect on that table. 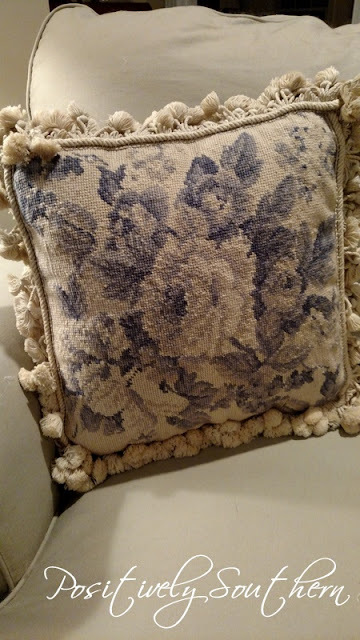 Oh, and I DID notice that amazing blue and white pillow. You nailed it all. I love that little table and all its goodness styled on it. Now, you must show where you put that other lamp. What a great find. Between the two of us we could open a blue and white store. Another great find and that is the perfect place for it!